500 out there, and going digital. 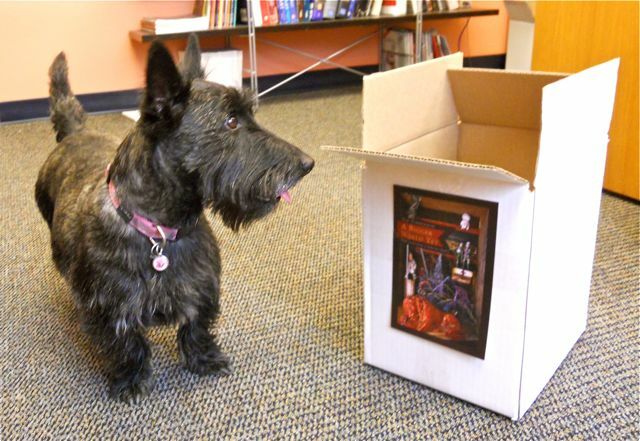 My Scotty dog Bonny, with the last and now empty box of books. So, about a year ago 500 “A Bigger World Yet….” books were picked up on a rainy day from a local printer, each with 100,074 words. Now, almost a year to date those 500 books and all of those words, are out there in the world hopefully being helpful to those who have read them. As of now, the plan is not to print any more hard copies of the book. We’re hoping a larger publisher will capture the vision of friendship and community the book speaks of, and be interested in publishing the book. Keep sending out those warm thoughts and prayers in that direction. Meanwhile, the book in some ways is going to be more available. It’s going digital. Right now it available directly through “Smash Words” : http://www.smashwords.com/books/view/140172 for $8.99. You can even read the introduction and part of the 1st chapter as well for free on line (what a bargain). Soon enough you should be able to get it through the kindle store, I-book and all of those as well. I’ll keep you updated. This entry was posted in The Book and tagged A Bigger World Yet. Bookmark the permalink. 1 Response to 500 out there, and going digital. That means that my copy that just arrived today must have been one of the last. I am so grateful! I read the first chapter tonight through tears. I can’t wait to dig deeper and yet I can tell this is a journey I want to savor. Thank you for your vulnerabity, courage and translucency… The grace of God is glowing through your writing. You were already a gift in my life, brother. This just makes the gift even richer. Blessings to you on your journey.